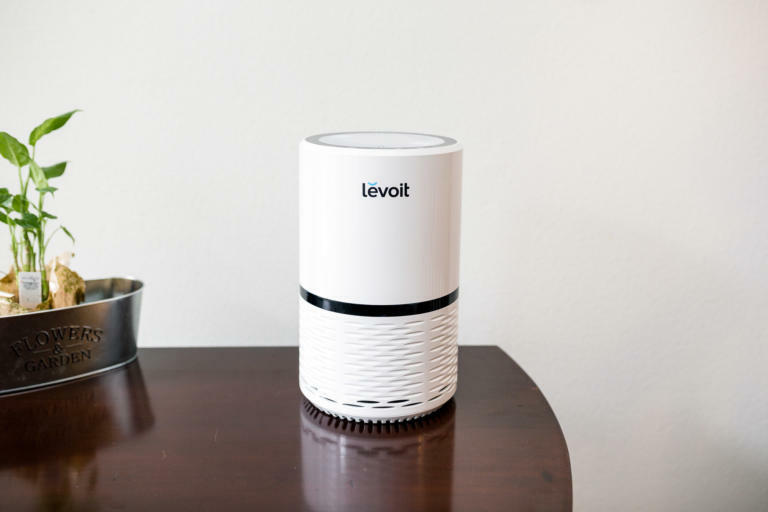 Levoit - LV-H132: Air Purifier Review • The Air Geeks, reviews of air conditioners, dehumidifiers and air purifiers. When it comes to air quality these days, it can always get better. If you especially live in cities it is possible you are inhaling dangerous fine particles from the industrial smog which are harmful to your health. To lessen the effects of harmful air it is advisable to use air purifiers where possible to make sure the air you inhale is cleaner. 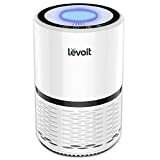 Levoit LV-H132 purifier is meant to clean indoor air using HEPA technology to ensure that 99.9% of particles in the air are removed. Let’s dive in and see what this product has to offer in terms of features. The fact that this purifier comes with a True HEPA (High Efficient Particulate Air) Filter, ensures particles as small as 0.3 microns do not get to pass through the filter. Small particles can exist undetected but can cause a lot of problems to the respiratory system if inhaled or exposed to sensitive body parts leading to all sort of problems ranging from allergens to asthma. Levoit LV-H132 does a good job to make sure that these particles don’t stay in your indoor air for long before being trapped by the filtration system. Most purifiers in the market produce ozone and harmful particles during the filtration process which is not the case with this purifier as it is 100% ozone-free. The purifier is very quiet on low setting and is ideal for use at night if you are easily woken up by fan noise. The high fan settings should, however, be used during the day as they raise the noise level. If you love subtle lights during the night, you can use this purifier’s lights of which their brightness can be adjusted to your preference. They can also be turned off in case you are not a fan of night lights. At only 6 pounds, this purifier is very easy to handle and can be placed anywhere be it on the shelves or on tabletops. The filters are easily replaceable (though they cannot be reused since they are not washable) and can last for as long as 6 months depending on the severity of the air pollution. It is also reliable as it is made of sturdy plastic materials that are hardened to make sure its lifespan is longer than most products that are similar to the market. This purifier is very stylish in design and it is one of the most regarded purifiers on the market with a look that blends very well with the interior décor. At a coverage area of about 68.1 square feet, this purifier is designed to cover small spaces like rooms but quite does well to make sure the air inside is well purified. If you need a purifier to a wider area than that you can purchase a larger one or just buy more of these and you should be good to go. Its air-suction capacity is about 110 CFM on its highest setting enabling it to cover the above area in a very short time (about 6 minutes to recirculate the polluted air). The control panel is easy to navigate with buttons that have icons to illustrate their functions. Some people, however, love to have explanations below the icons so they won’t have to refer back to the manual every time they need to press the button. This especially applies to those who are new to appliances like purifiers. A 2 – year warranty is included with every purchase of Levoit LV-H132 which guarantees longer customer support and easy parts replacements in case of damage. Limited scope: With its small size, you can't rely on it to work on large areas. We live in the heart of Manhattan and we bought this particular product as I can smell cigarette smoke coming through the walls from the neighbors. I also wake up with a stuffy nose most days. I put the product in the room to test it and was blown away by how awesome the air smelled. Like being up a mountain. I can't smell cigarette smoke and after the first night of using the air purifier, I didn't have a stuffy nose in the morning. I highly recommend this product to anyone who lives in a city. You don't realize how low the quality of air is until you try this product, and it really does make a significant difference. Super impressed." After having used this for a few months I can confidently say how great this air purifier is. With the wildfires, the air quality in Oregon has been very unhealthy and at times hazardous. Combined with the heat we have no choice but to leave our windows open or the air conditioner running. We also have hardwood floors so the dust, dander, and pet hair gets kicked up very easily. This air purifier has made a world of difference! No smoke smell in the room it's running and I don't have to worry as much about my son constantly breathing in the smog. We haven't had to change the filter yet, just occasionally clean the dust and pet hair stuck around the outside of the air intake"
This purifier hits the right spots on those who love portable appliances that are easy to move and are designed well to be placed anywhere while also working effectively to ensure clean air free of smog and dust particles. If you are one of those people we are very happy you found the right purifier in Levoit LV-H132 and we are confident you have made the right choice considering the features elaborated above. While no product would fill everyone’s need, we can confidently say this one might be worth to purchase.